An expert cancer researcher and advisor to the World Health Organization International Agency for Research on Cancer (WHO/IARC) has issued his scientific opinion that radio-frequency (RF) radiation from any source – such as the signals emitted by cell phones, other wireless and cordless and sensor devices, and wireless networks – fully meets criteria to be classified as a “Group 1 carcinogenic to humans” agent, based on scientific evidence associating RF exposure to cancer development and cancer promotion. “The evidence indicating wireless is carcinogenic has increased and can no longer be ignored,” stated Dr. Anthony B. Miller at a July 31, 2017, lecture in Jackson Hole, Wyoming sponsored by the Environmental Health Trust where international experts presented the best available science on “cell phone and wireless radiation”. In 2011, WHO/IARC classified RF radiation from any source as a “Group 2B possibly carcinogenic to human” agent. Miller believes the evidence published since 2011 fulfills the requirements to re-classify RF radiation as a “Group 1 carcinogenic to humans” agent. Dr. Anthony B. Miller is a physician epidemiologist who specializes in cancer etiology, prevention, and screening. Miller is Professor Emeritus at the Dalla Lana School of Public Health of the University of Toronto and Senior Medical Advisor to the Environmental Health Trust. He has been a longtime advisor to the World Health Organization (WHO) and was Senior Epidemiologist for the International Agency for Research on Cancer (IARC). He served as Director of the Epidemiology Unit of the National Cancer Institute of Canada, Chair of the Department of Preventive Medicine and Biostatistics at the University of Toronto, Head of the Division of Cancer Epidemiology at the German Cancer Research Centre, and Consultant to the Division of Cancer Prevention of the U.S. National Cancer Institute. He has performed research about electromagnetic fields and cancer and has served on many committees assessing the carcinogenicity of various exposures. Miller was visiting Senior Scientist in the IARC Monographs programme as a reviewer to the scientific literature supporting a designation of Radiofrequency Electromagnetic Fields (RF-EMF) as a Group 2B possible carcinogen in 2011. In addition, published epidemiological research has also found persons diagnosed with brain cancer had decreased survival rates associated with higher wireless phone use. In response to skeptics who claim, “There is no evidence,” researchers point to published research that has consistently found increased cancer risk in well-designed case-control studies that have looked at persons who used cell phones for more than ten years. On July 31, 2017, panel presentation included international experts. 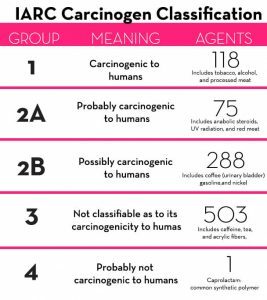 Dr. Annie Sasco presented the WHO/IARC process used to classify carcinogenic agents. Dr. Iris Udasin’s clinical cases of World Trade Center first responders who developed brain cancer after combined environmental exposures to chemical toxins and wireless radiation. Theodora Scarato, MSW presented policies enacted by governments worldwide to reduce RF radiation exposures. Dr. Marc Arazi presented data released by the cell phone radiation test program of the Government of France, which found that when cell phones are tested in body contact positions, RF radiation exposure exceeds regulatory limits. Environmental Health Trust plans to post all lectures and videos from the July 31, 2017, presentation online.